In 1974, A.I. Morozov and L.S. 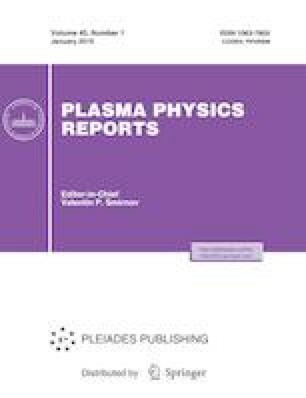 Solov’ev derived a general system of time-independent equations of two-component ideal plasma hydrodynamics . This system is extremely complicated and cumbersome. For the axisymmetric case, the authors succeeded in writing it in a more compact form by introducing three flux functions for the magnetic field, electrons, and ions. The situation resembles the derivation of the Grad–Shafranov equation, when the problem of static plasma equilibrium is reduced to one second-order equation for the magnetic flux. In this case, in order to close the problem, it was required to specify two arbitrary parameter functions. When considering flows instead of static equilibrium, the number of parameter functions increases. In the present work, the Morozov–Solov’ev equations are used to describe steady-state plasma configurations in toroidal magnetic traps. I am grateful to M.B. Gavrikov for helpful discussions. This work was supported by the Russian Science Foundation, project no. 16-11-10278.